A former gang member turned community leader, Terrance Stone has lived a story you’d expect to see in a movie. But instead of lending his story to Hollywood, he’s given his life to empowering the lives of thousands of young men and women in our community. 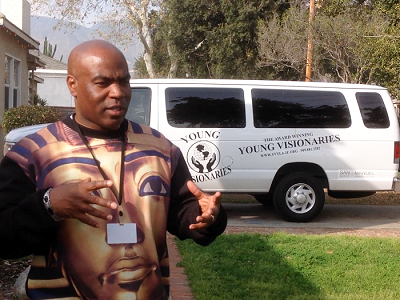 Stone is the CEO of Young Visionaries Youth Leadership Academy (YVYLA), a nonprofit he started in 2001 that’s dedicated to steering young people away from the kind of life that cost Terrance much of his own. “I try to use myself as an example. I’m very transparent when I’m out and talking to kids. We just try to spark that inspiration in young people so that they know they can do it, they can be whatever they want to be,” said Stone in a 2010 interview. In an area blighted by systemic challenges of poverty and chronic unemployment, YVYLA has helped take local youth off the streets and onto a track of success, serving over 10,000 young men and women to date. “It’s just trying to fill a need and a void in the community. Every time we start a program. It’s based off what the needs are of the community—right now,” said Stone. YVYLA and its expansive services are indicative of that belief. In addition to the personal development and youth mentoring programs they provide, YVYLA operates the only runaway youth homeless shelter in the San Bernardino area, one of two County-wide. This March marks the shelter’s third year in operation. With over a decade of experience working with transient and troubled youth, Stone knows the right approach in working with individuals who find themselves without a place to stay. Stone makes it known that the shelter isn’t simply a “flop house.” Children (ages 14 to 17) who enter the shelter are required to be enrolled in or back attending school within 48 hours. Every participant is in the home for up to 21 days, giving YVYLA case managers time to assess an individual’s immediate needs and establish short-term goals with the intention of leading to the person’s long-term success. To learn more about Terrance Stone and YVYLA’s education and employment programs, youth shelter, and more, visit yvyla-ie.org or email info@yvyla-ie.org.